Alcatel-Lucent Submarine Networks (ASN), the undersea cables subsidiary of Alcatel-Lucent (Euronext Paris and NYSE: ALU), has achieved a breakthrough record of data transmission over a distance of 10,000 kilometers using real-time processing prototypes of a unique cost-effective 300 gigabits-per-second new modulation technology that will optimize the performance of submarine cable systems. The trial has been achieved on the 10,000km of ASN’s test bed, combining the innovative 300G 8QAM (8 quadrature amplitude modulation) technology of ASN’s 1620 SOFTNODE platform and second-generation coherent submarine fiber (CSF-2). 8QAM technology can optimize both existing and new undersea cable systems, enabling operators to deliver more than 15 terabits-per-second (Tbit/s) per fiber pair on transoceanic systems - equivalent to 2.25 million HDTV channels streamed simultaneously. 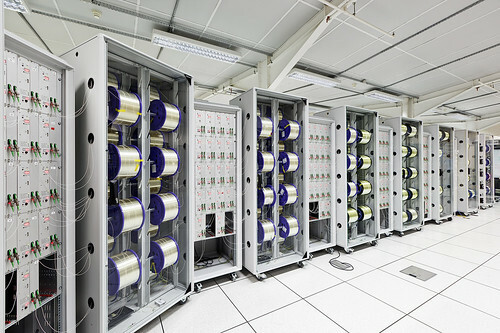 Leveraging the largest research and development capabilities in the submarine cable industry, in Villarceux, France, ASN has achieved several breakthroughs in both repeatered and unrepeatered submarine cable systems. This new record is the latest in a long series of two dozen records over the past 20 years, all showcasing breakthroughs that have transformed long distance data transmission.